Careers for English Majors. What You Do After English Graduation? After completing successfully graduation, we find some careers for English majors. And we have limited options. In this article will see some different options where you can join after completing English degree. The basic qualification required for the study is 10+2 from a recognized board. Students who have a flair for writing and interested in enjoying reading English can opt for this course. The course has a number of groups as mentioned below. All these courses are available in reputed colleges and universities in the world. The career opportunities in Literature. To achieve the highest level of writing Literature is required. English as the language which is well read and written apart from mother tongue in India. Plenty colleges are available in India which offers literature courses and advanced studies in the same field. The study deals with fiction, drama, technical writing, and best communication. 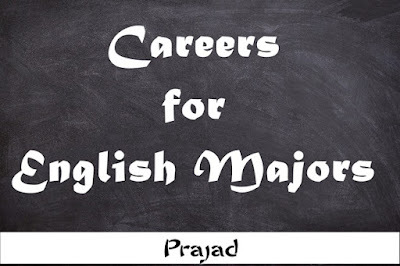 The opportunities jobs for English majors literature graduates are abundant in India and abroad. With a good skill set and subject proficiency obtaining a job is never a tough task for literature graduates. Tutors are one of the best careers for English majors. You have good knowledge of the English language then you can take a lecture for a special. In today world comes near, from your computer you can do a job for other state, Countries as a tutor. So that is one of good career option. You can also make as a full-time job. English major attended and aimed for government teacher’s jobs and other government-related posts. More private and government schools, colleges and universities hire these graduates to work as teachers and lecturers. Language interpreter’s teachers can very well earn up to 20,000 per month. Interpreter means translate speech or pepper to one language to another language. For that type of job, you have to at least two languages. There is many more job opportunity for the legal interpreter. Some interpreter work as self-employed, some of the charge for per hour. There is also an option for online translate job. Where you can earn easily with simple translate document or file. If you have good knowledge of the English language and you have good communication skill then you can choose this career. The anchor means to host any type of program with a good and exact word. These are professional work in radio, sports, delivering news, live shows, and music programme. An English degree helps to write a script for announcers that are clear, effective and engaging. This job creates a great opportunity for English major. Copywriter job means creating a slogan, a script for advertising for printed advertising. You have a good creativity and love to make word something to turn on eye-catching. Then you can try as a copywriter in an ad agency. You really enjoy that work. Editor work for magazine or newspaper is old career option from starting newspaper industry. Work as a journalist or editor is the growing sector. In the coming years, it will be 3% grow. Because today everyone has read news on their mobile or pc. With reading uncountable books without buying them and would get paid for taking care of them. That job where you can work as book caretaker. English major degree gives you an option to become an author. If you have creative bend mind then you can start to write your novel. With an English degree, you can join for a content writing job. For blog and other content writing now demanding with growing digital industry. You can write content on any niche. With Freelancer, you can work with different type of website and earn form doing simple writing work. Public relation is popular careers for English majors, it is a communications process that creates and build a good relationship between two originations. Most multinational company’s hire English degree student to create a good public relation. BPO means Business Process Outsourcing and KPO expands to Knowledge Process Outsourcing. You can join as customer support executive, technical support executive or process executive with your language knowledge. Most of BPO’s have a contract with an international company, they hire more staff for work. It is the largest growing field, for making good dialogue, dubbing voice and other language-related work. You can apply job for drama and entertainment field job which is hiring for good skill man force. Literature graduates can prepare and attend service exams and get to civil service jobs. The public sector is more responsible for hiring a large workforce in administration, workers, police, army and government staff. That is some option which you can choose after graduation. There are many other options also you can find easily with the internet. I just share simple and easy careers for English majors.